If you happen to be boating on the Medomak River in Waldoboro, Maine, you might encounter a little flotilla of buoys adorned with brightly colored flags drifting in and out with the tides. 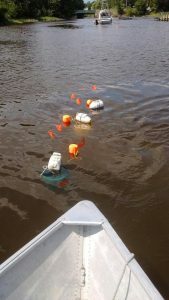 These “bucket drifters” are packed with scientific instruments that, for example, measure conductivity, temperature, and depth of seawater to better understand the estuary’s ability to flush out harmful bacteria. In the wake of rainstorms of more than an inch in 24 hours, clam flats are closed for a mandatory nine-day period due to health threats from these bacteria. In such cases, most of the Medomak is off limits to the 175 licensed shellfish harvesters, which can cause economic hardship for extended periods of time. 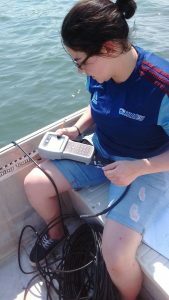 Leading the fieldwork is UMaine Master’s student Gabrielle “Gabby” Hillyer, now in her third-year as a dual-degree oceanography and marine policy major. On the Medomak project, Hillyer is working with Bridie McGreavy, assistant professor in the Department of Communication & Journalism and a Mitchell Center Fellow, and assistant professor Damian Brady of UMaine’s Darling Marine Center. Funding for what’s known as the Medomak Water Quality Partnership comes from the Diana Davis Spencer Partnership for a Sustainable Maine, the UMaine Research Reinvestment Fund, and Maine Sea Grant. The ultimate goal of the Diana Davis Spencer Partnership is to develop solutions to complex problems that require a delicate balance between economic development and environmental protection. One key step towards that goal is to inspire a new generation of entrepreneurial leaders by providing students with hands-on experiences in collaboration and problem-solving. Hillyer is one of six Diana Davis Spencer Scholars selected to work on the Strengthening Coastal Economies project. For the project, Hillyer, works closely with commercial clammer Glen Melvin, who is chair of the Waldoboro Shellfish Committee and sits on the Maine Shellfish Advisory Council. Before she released any drifters into the Medomak, Hillyer interviewed eight clammers and, based on that, she and Melvin have been exploring specific mudflats that the clammers themselves identified as areas they felt needed further exploration in terms of a more in-depth scientific study. “Bucket drifters” drift in and out with the tides on the Medomak River. Hillyer adds that the drifter work is also seeking to determine if water currents change drastically when there’s a rainstorm, which could affect which clam flats are at the greatest risk of bacterial closures. For the upcoming field season, in addition to again taking seawater measurements, Hillyer will conduct interviews with various collaborators about future endeavors for the project. She will also conduct storm bacteria sampling with community collaborators to better understand the effect of immediate dilution of bacteria during rainstorms, and work with her Diana Davis Spencer colleagues to understand how to more effectively engage with stakeholders through collaborative field work.